In Toronto, Ontario, Canada—which boasts the world’s longest urban waterfront—the Gardiner Expressway has long been a source of contention. The most expensive highway per mile ever built, it has for decades blocked the city’s waterfront revitalization. Nothing new about that, of course: badly-planned waterfront highways have sabotaged hundreds of cities worldwide. More than a few of my talks and workshops in Toronto over the past 20 years have touched on the future of the road. One of those talks was at the Toronto Board of Trade. If he did, that prayer was never granted. 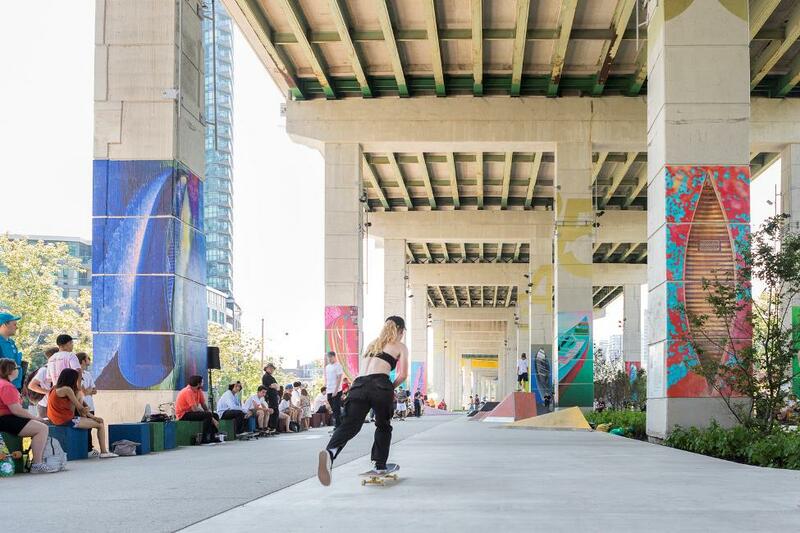 But the prayers of many other Torontonians—to see their downtown neighborhoods reconnected to Lake Ontario—have now been at least partially answered, via the Bentway. The Bentway is an urban trail and series of pocket parks that repurposes, renews and reconnects (AKA: the 3Re Strategy) the ugly concrete spaces under the Gardiner. The goal was revitalization, which it seems to be achieving nicely. The project is unprecedented in many ways. It was funded through a unique public-private partnership between the City of Toronto and philanthropists Judy and Wilmot Matthews, who contributed $25-million to the project. Judy and Wil were inspired by the vision of urbanist Ken Greenberg and landscape architecture firm PUBLIC WORK to re-imagine the expressway –arguably the city’s most divisive symbol of 20th century transportation planning – as a new model of shared public space activated by year-round programming. 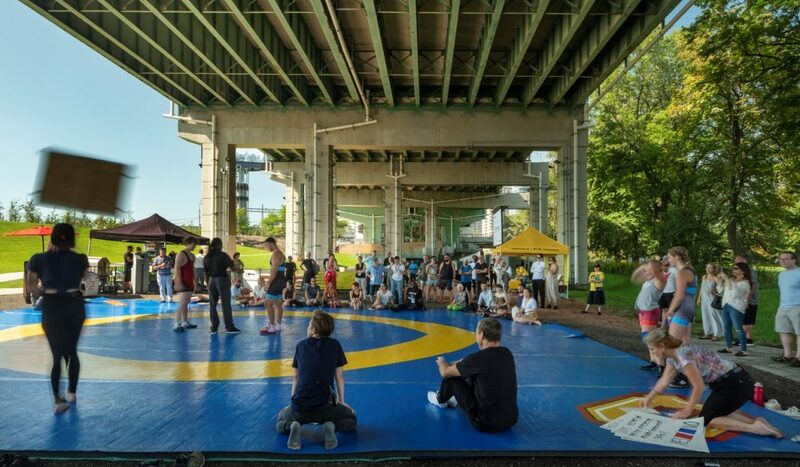 Extensive public consultation with neighbours and an array of potential user groups informed both PUBLIC WORK’s design of the physical environment as well as the programming, which is now being brought to life by The Bentway Conservancy, a new not-for-profit that manages, operates and programs the space. 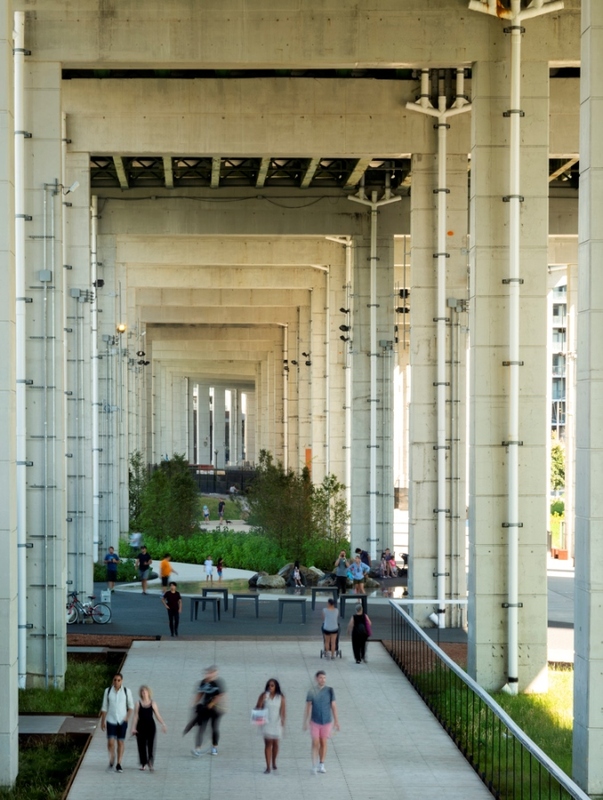 PUBLIC WORK’s starting point for the design was the Gardiner’s series of supportive concrete columns called “bents,” that can either function together or on their own to offer spaces for a diverse range of programming and events – from passive, contemplative spaces to creative hubs and marketplaces. The expressway provides a canopy at varying heights from intimate to a majestic 15-metres high, with the bents offering structural support for clamps, cables, power and lighting – which are designed to meet both the requirements of large performance groups and the needs of fringe productions. On the ground, the project knits together public and private land, treats storm water and repurposes displaced soil to establish a new topography. Visitors descend into The Bentway at Strachan Gate via an open-air amphitheatre complete with washrooms and a green room, and bleachers to seat about 250. They can enjoy performances there or on an adjacent lawn that can accommodate another 500 people. A cedar “wharf” in front of the Fort York Visitor Centre offers another event space, adjacent to a “liquid landscape” of indigenous grasses that will be watered by storm run-off from the roadway above through a sustainable and thoughtful drainage system. The 220-metre skate trail that opened in January 2018 becomes a path with a kids’ splash pad in the summer. 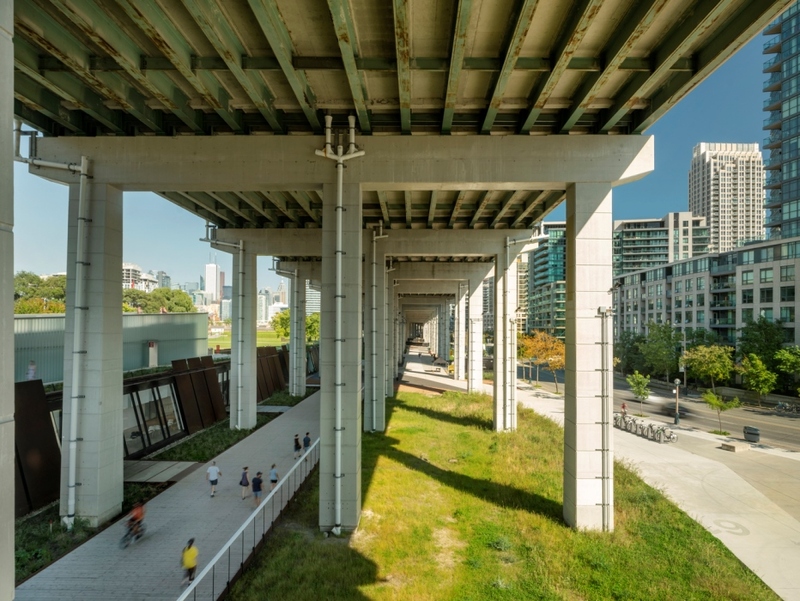 In the next phase, a wooden bridge suspended from the underside of the Gardiner will provide a warm and organic contrast to the industrial aesthetic and a safe route across Fort York Boulevard. From the bridge visitors will be able to look down onto Fort York, thereby broadening both the accessibility and awareness of the historic site. 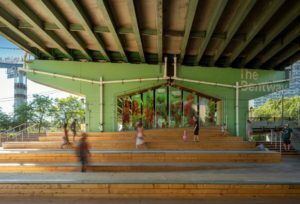 The novel design of the bridge, constructed from cross-laminated timber and glulam, harnesses the excess structural capacity of the existing concrete bents of the Gardiner to suspend the bridge from the existing structure. All images courtesy of PUBLIC WORK / Nic Lehoux. 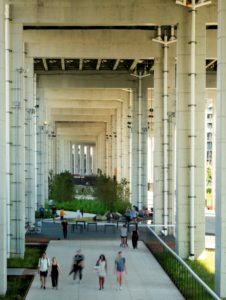 See The Bentway Conservancy website.